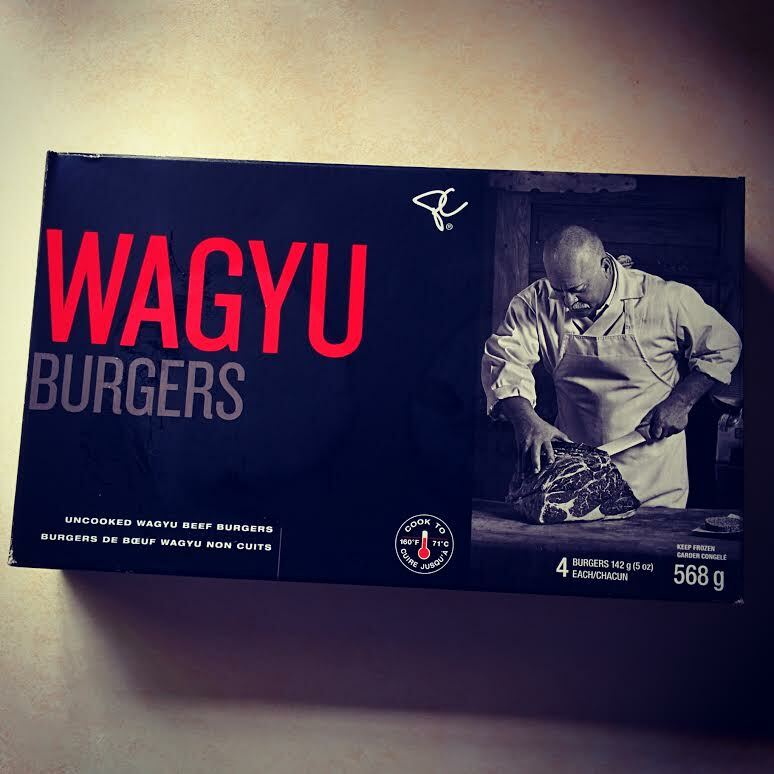 Let’s leave the “Wagyu” debate until the end of this post, are these burgers actually good? President’s Choice Black Label series is the best of the best that PC offers, here’s how they describe it on the PC website “The President’s Choice® black label Collection brings an exceptional array of fine foods and flavours from around the world and here at home, to the grocery store. All with the value and convenience you expect from the PC® brand. Not only are they an extraordinary selection, they’re the very best we’ve ever tasted”. Ok, but what does that actually mean? The packaging is minimalist and “Wagyu” punches you in the face with its bold, gigantic redness. The stately fellow pictured with the large knife cutting into a gorgeous slab of marbled beef looks promising. Then you notice the little round meat puck to his left, almost as if they don’t want you to see it? The frozen burgers look like pretty much every other frozen burger I’ve ever seen, complete with assembly line dimples. They’re slightly thicker than a typical frozen burger, I’d say roughly 5/8ths of an inch. They are uncooked and the box recommends to cook them from frozen for 5-6 minutes per side over medium heat on a BBQ or in a frying pan. Once cooked the burgers take on a slightly reddish orange colour with lots of fat trying to escape through the middle. The high fat content of the beef (typical for “Wagyu”) and the fact that the second ingredient is water means lots of big flare ups on the grill. So much so that I slightly over toasted my burger buns. Keep an eye on these things while cooking. 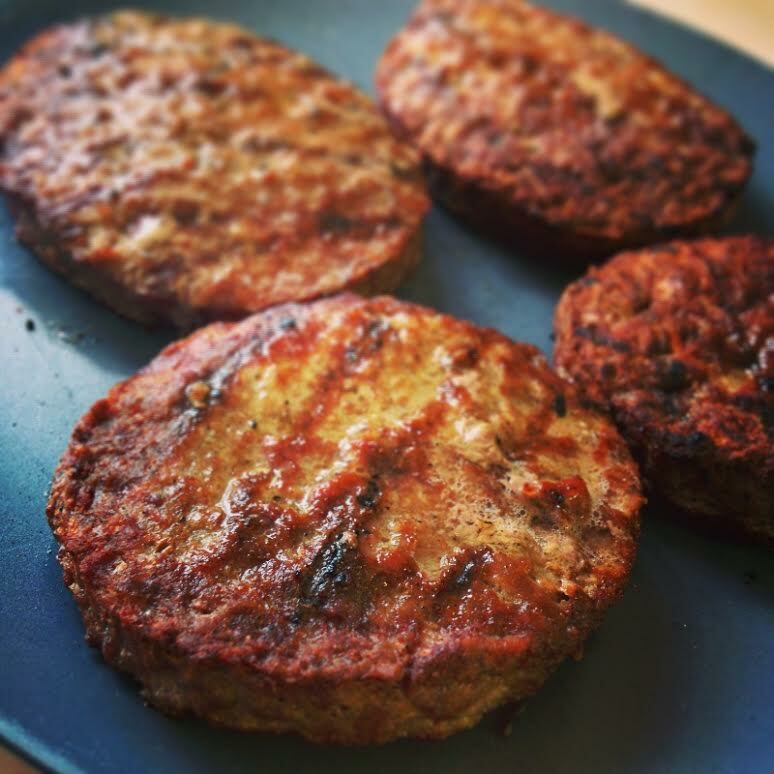 The cooked patty ends up with a crusty outer layer and the colour changes to a more consistent brown after resting. The burger is very moist, has good flavour, and a nice firm texture. 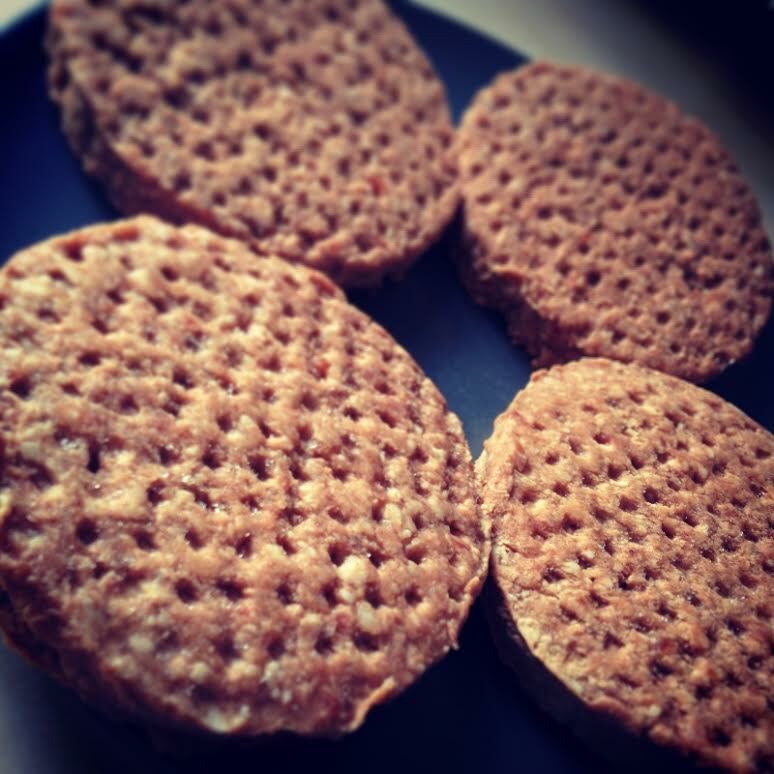 The flavour is similar to lots of other frozen burgers as is the texture. 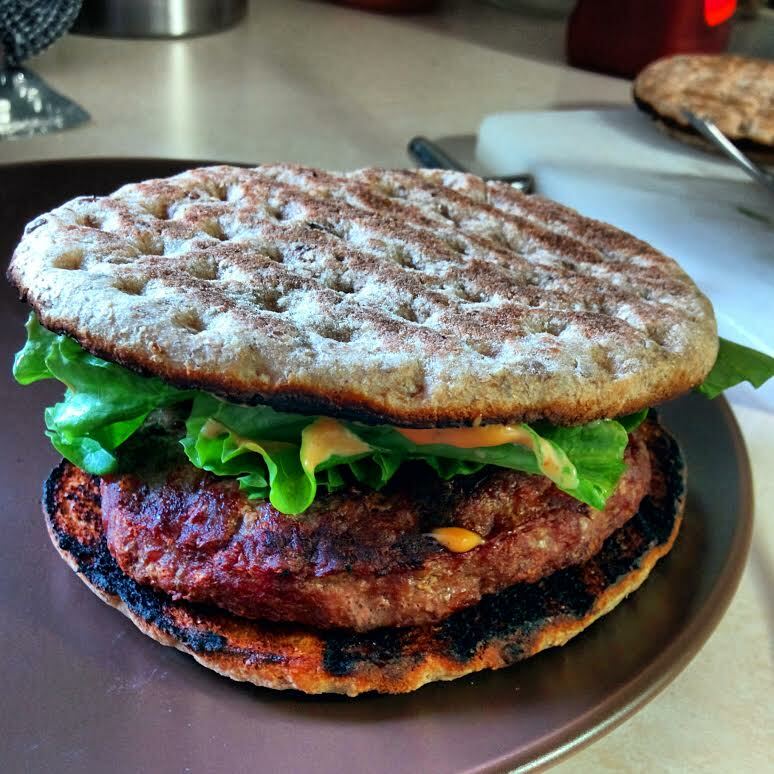 It loses very little size and retains its shape which is not typical of other frozen burgers. I ate some of one patty on its own and had another on a PC Blue Menu Thins – Multigrain Round bun which are really quite good. Notice the flare-up induced charring around the edges of the bun. I kept it simple with some romaine lettuce and Stonewall Kitchen Smoky BBQ Aioli (you can find it at Fresh Street Farms and it’s amazing). As a complete burger it was very tasty. Now, let’s ask some questions. These burgers cost almost $11 for 4 five ounce patties. That’s $2.75 per patty. I can make a damn good burger myself for that kind of money. The big issue I have with these burgers is the word “Wagyu”. Once synonymous with beef raised only in Japan the word itself means “Japanese cow’. PC uses the word “Kobe” in the description of these burgers on their website, “From the Kobe beef family, Wagyu beef is loaded with sweet, rich buttery flavour from omega-3 rich marbling, making it one of the most succulent meats in the world”. This is a blatant lie. Kobe beef is specifically Tajima-gyu cattle raised in the Hyogo Prefecture of Japan. Everything else is a fabrication. There is VERY little Kobe beef exported to Canada and no one in their right minds is going to grind it up and freeze it. There are farms in Canada, Australia, and the United States raising “Waygu” beef that has bloodlines traceable to Tajima-gyu cattle in Japan. There are other farms with cattle that have bloodlines traceable back to other strains of Japanese cattle. These farms use the “Wagyu” tag in a dishonest way to charge more for their product. I’m not saying their beef is substandard, in most cases it is VERY high quality, but it is not real Waygu and is most definitely not Kobe. I contacted PC through Twitter to try and see where their Waygu was from and here’s their answer. @WFLBC (1/2) Our Wagyu Beef Burgers are from a specific bloodline that’s certified authentic by 3rd party, through DNA genetic profiling. Let’s talk about DNA profiling. If I descended from Napoleon Bonaparte and this was traceable by 3rd party DNA profiling would that mean I am a tiny French dictator?. No, it would not. Was Michael Jordan’s father the best basket ball player of his generation? Not that I’m aware of. Genetics play a part in the make up of of certain breeds of animal and specific traits that these animals carry from generation to generation but there’s more to Wagyu than DNA. The environment, the feed, the treatment the animals receive, it all contributes to the finished product. I asked them to, at the very least, tell me what country the cattle are from and they did not reply until the following day. I called the PC customer service number and was told that they couldn’t access this information. There is a small Canadian Food Inspection Agency (CFIA) logo on the box but that just means it was inspected and meets Canadian standards. Why the mystery PC? When they finally got back to me this is what I was told. The Australian Wagyu Association is a promotional group whose singular purpose is to extol the virtues of Australian “Wagyu” all over the globe. The best part of their website is their disclaimer, “Information contained on the Australian Wagyu Association (AWA) web database, including but not limited to pedigree, DNA information, GeneProb values, Estimated Breeding Values (EBVs) and Selection Index values, is based on data supplied by members and/or third parties. Whilst every effort is made to ensure the accuracy of this information, the AWA and the Agricultural Business Research Institute (ABRI), their officers and employees, make no representations or warranties as to the accuracy of completeness of the information. AWA disclaims all liability for all claims, expenses, losses, damages and costs any person may incur as a result of the information contained on the AWA web database, for any reason, being inaccurate, or incomplete in any way or incapable or achieving any purposes”. So basically the farmers can claim whatever they want and the AWA will promote them! What a joke. Similar disclaimers adorn the Canadian and American “Wagyu” Association websites. Here’s my conclusion, these things are fake and a waste of money. Grinding up real Japanese Wagyu is the dumbest thing anyone could do with such a fine grade of beef. 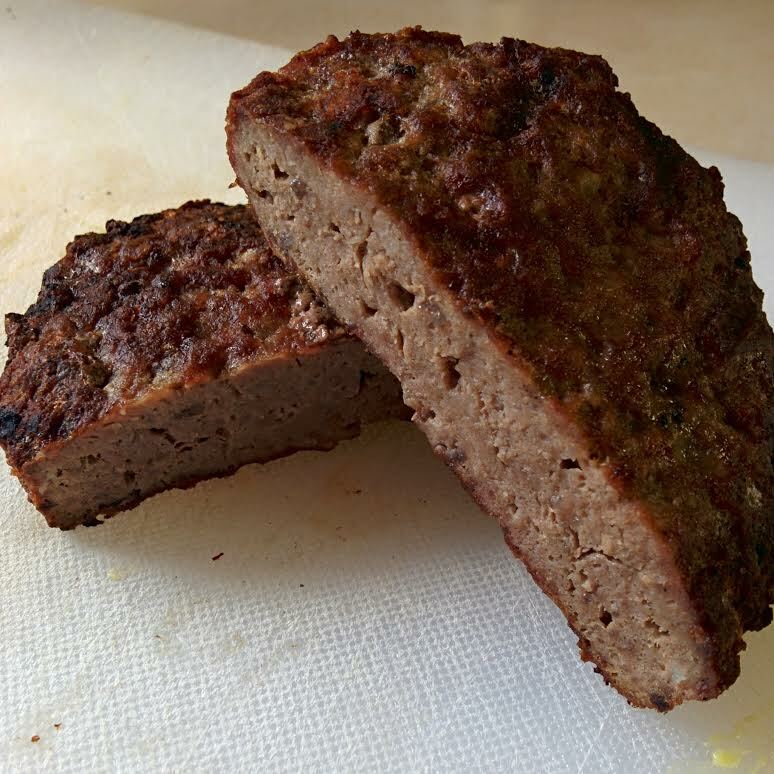 Go to a butcher shop or a grocery store with a REAL BUTCHER and get them to grind you up some nice chuck or even sirloin, you can make way better burgers yourself for less money and it’s great to know what’s actually in them. Did you know that there’s a part of Richmond located in the middle of the Fraser River that you can only access from Marpole? 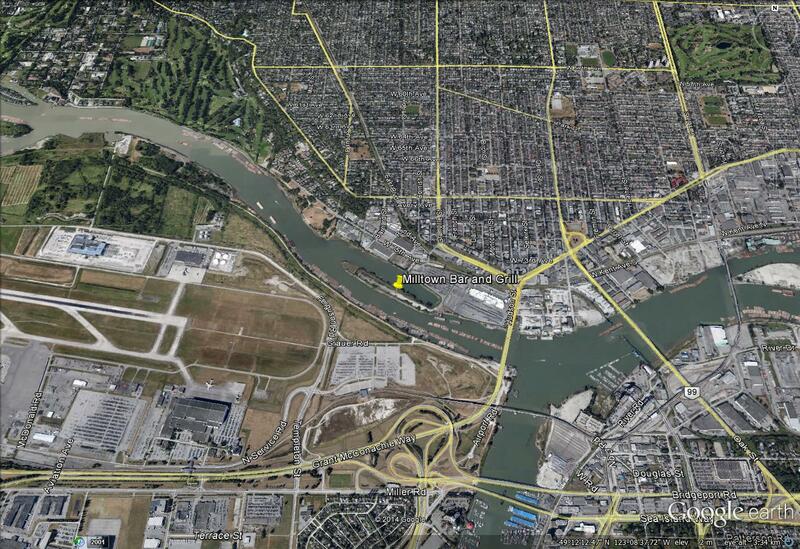 There’s a tiny Island called Richmond Island located on Musqueam land that is part of a development called Milltown. There’s a new Bar and Grill at 9191 Bentley Street, which is the home of Milltown Marina. Milltown Bar and Grill is pretty damn cool. 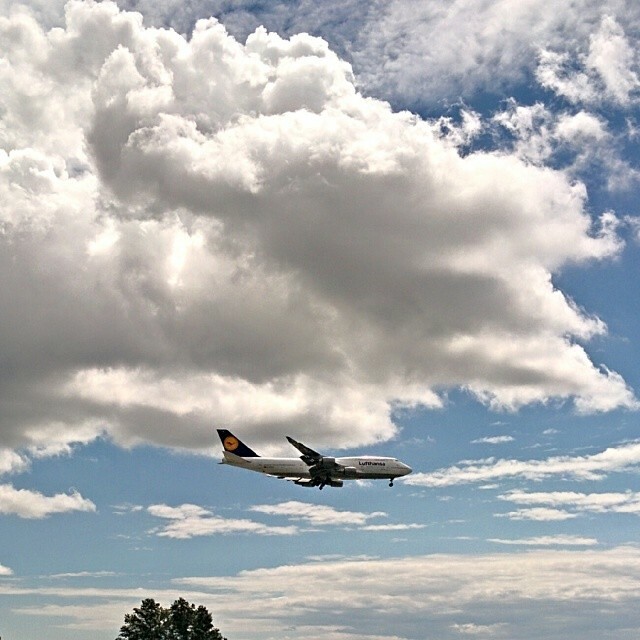 Milltown sits just north of the Vancouver International Airport and has an incredible view of the north runway. More on that later. There’s a rotating craft beer tap, currently Hoyne Devil’s Dream IPA, and a small selection of craft bottles to keep my beer nerd pals happy. 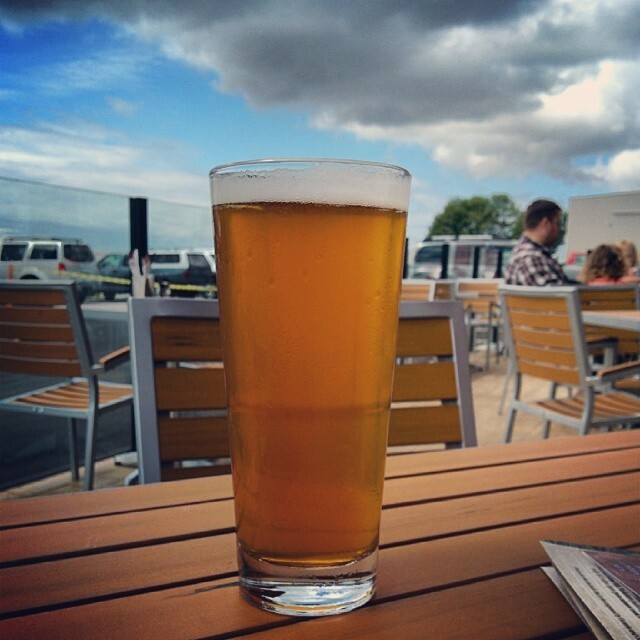 The Devil’s Dream was pouring beautifully and was the perfect companion to sunshine and plane watching on the south patio. There’s another patio on the north side that overlooks the marina, they’re both good choices if you like to sit outside. The menu is a classic west coast bar and grill line-up with all the usual suspects along with some non traditional items like Butter Bhicken, Halibut Tacos, and Salmon Wellington. I opted for the Freighter Burger, a house made all beef patty with Pale Ale BBQ sauce, bacon, and gouda plus the standard veg. 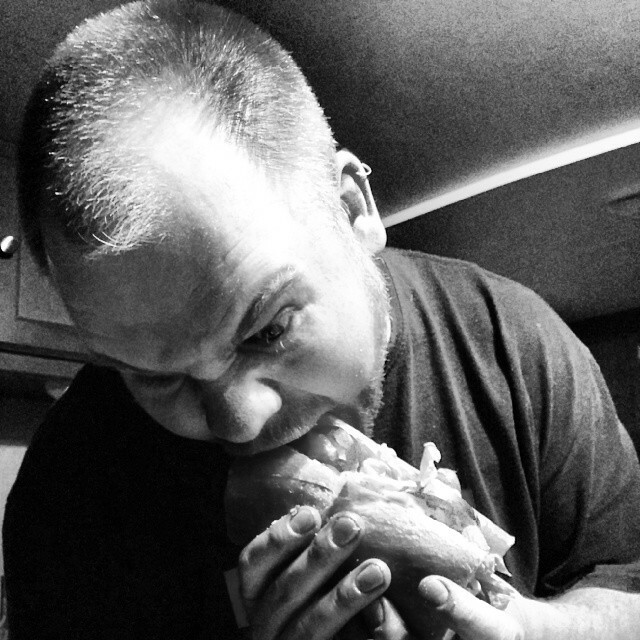 The freighter is a solid buger, I’d order it again. The house made patty has nice tecture and is properly seasoned. The fries that came with it are battered, something I’m not super keen on but they were tasty none the less. I’d love to see in house hand cut fries with this burger! 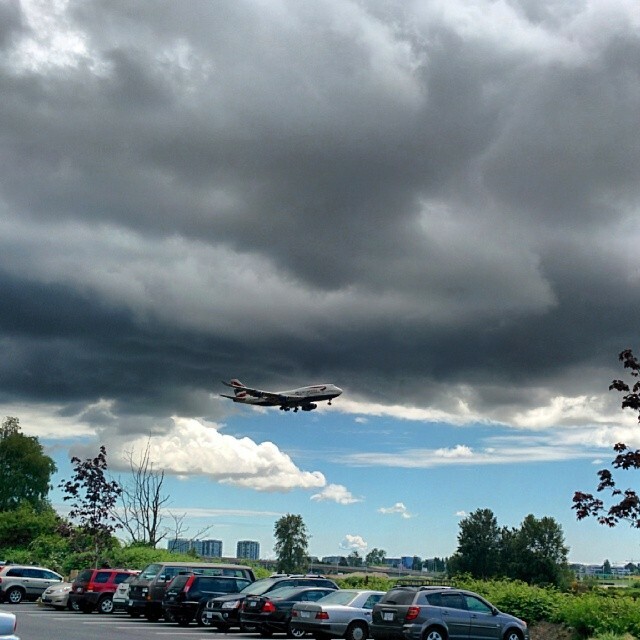 Sitting on the north patio puts you up close with some pretty big planes landing at YVR from all around the world. The noise isn’t as loud as I thought it would be and watching planes land is pretty awesome, ya know? Here’s a couple of 747-400’s I managed to photograph. 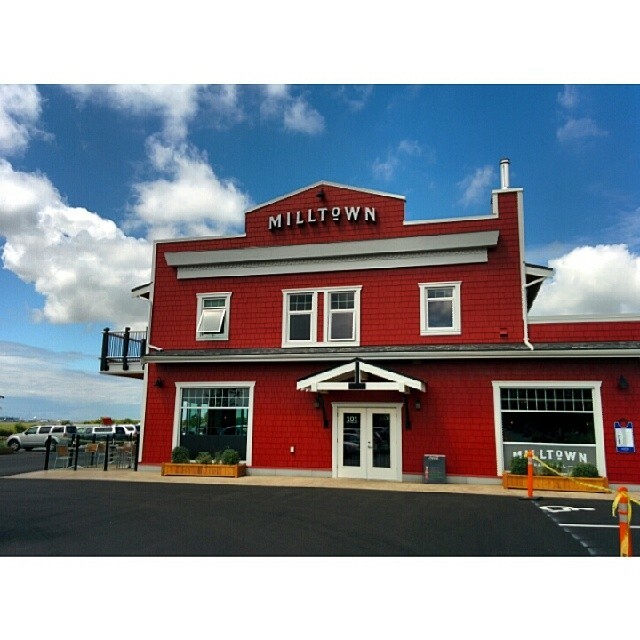 Overall Milltown Bar and Grill is a great place to spend an afternoon. There’s tons of parking, good beer, tasty food, lots of action on the patio, and you can bring the whole family (something I did not know until after I got there…oops). Here’s a handy Google Earth shot to show you where they are, followed by all their pertinent links and so forth. 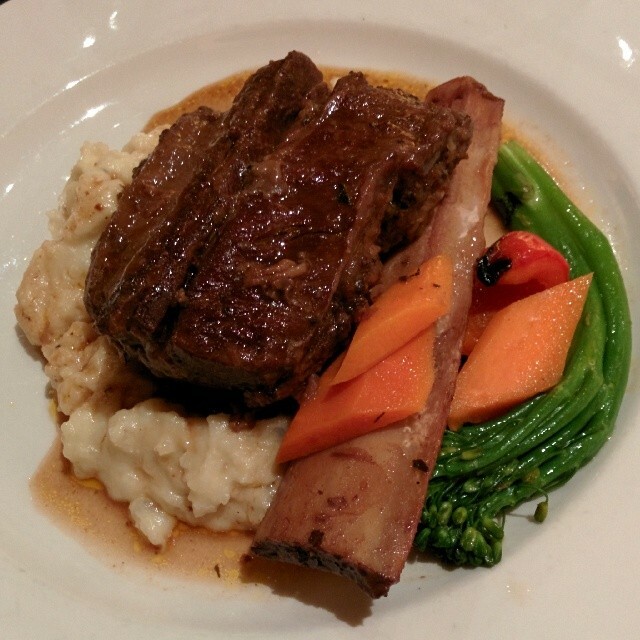 I was recently invited to Sabatino’s Trattoria in South Surrey to sample some dishes from their new menu. It’s been awhile since I’ve done a menu tasting as I’ve been blogging less and exploring Vancouver with my camera more these days but it was nice to be back in the game. I was joined by May and Dennis of pangcouver.com and Sherman from shermansfoodadventures.com, good company indeed. 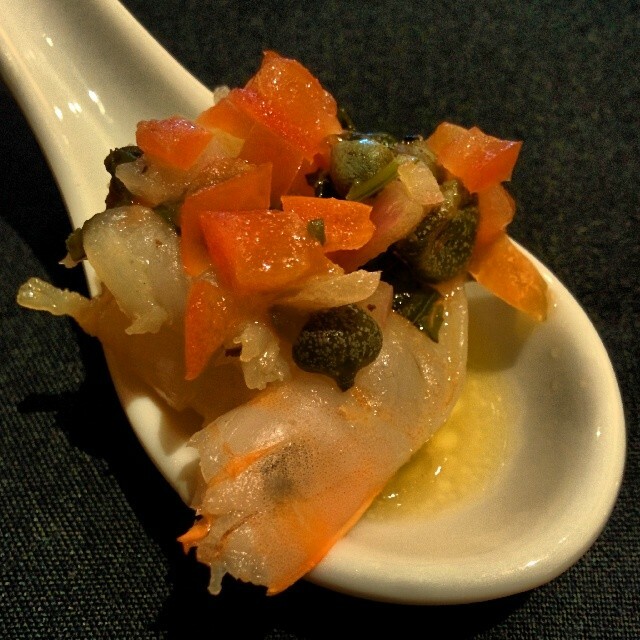 We were treated to Gamberi Napoli as an amuse bouche, Tiger prawn flambéed in Pernod with garlic, grape tomato, onion and basil. There was a very slight hint of licorice from the Pernod and the prawn balanced well with the tomato and onion. A little more seasoning would’ve made this a home run but it was still quite nice. Next up was the Barbabietola Arrosto, a lovely roasted beet salad. 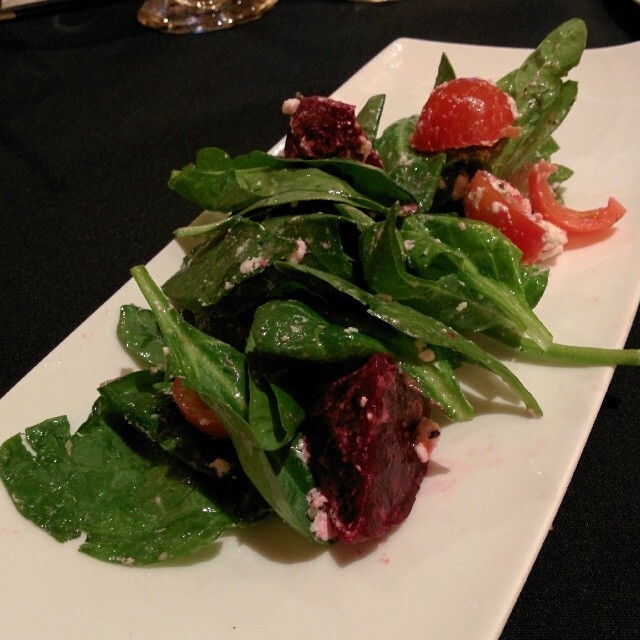 Roasted beets, goat cheese, tomato, and roasted walnuts with spinach and dill vinaigrette. The dressing wasn’t overly oily and the dill worked well with the earthy beets and the punchy goats cheese. When I started writing about food 4 years ago I never thought that beets would end up being one of my favourite foods. Spaghetti Carbonara was the next dish to arrive. Rich, rich, did I mention it’s rich? 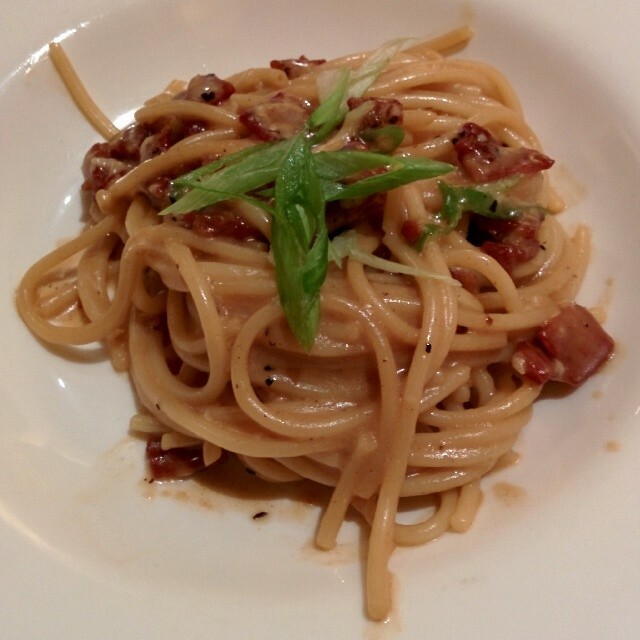 I love Carbonara but it’s not something I could eat often. Prosciutto, egg yolk, and Granda Padano wrapped up in tender spaghetti noddles. Slightly more oily than I’d anticipated but the deep, rich flavours were great. The main course was Brasato al Valpolicella, red wine braised shortrib on the bone with mashed potatoes and roasted vegetables. The short rib is from Two Rivers Meats and is outstanding. Braised perfectly, seasoned well, juicy, tender. The potatoes are rich and creamy and quite dense, not your average restaurant mash. 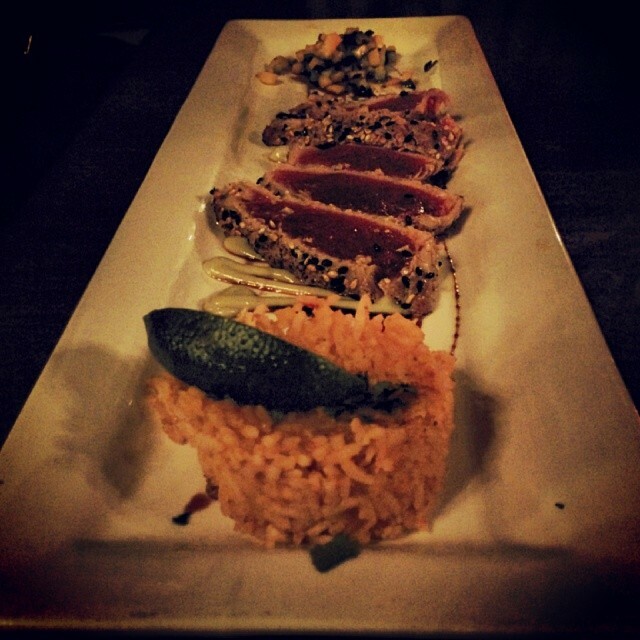 This dish was a winner from start to finish. Along with my food there were some great, original cocktails and bold red wine being served. 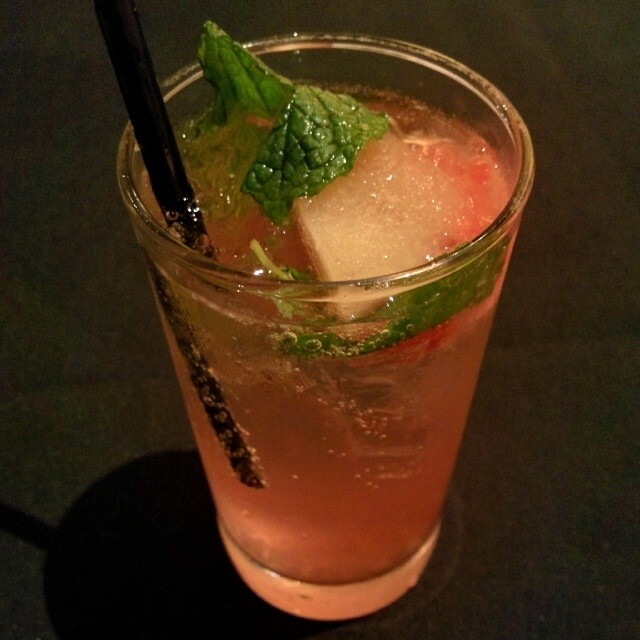 My favourite was the Agavé Julep, a tequila based cocktail with mint, watermelon, simple syrup and soda. 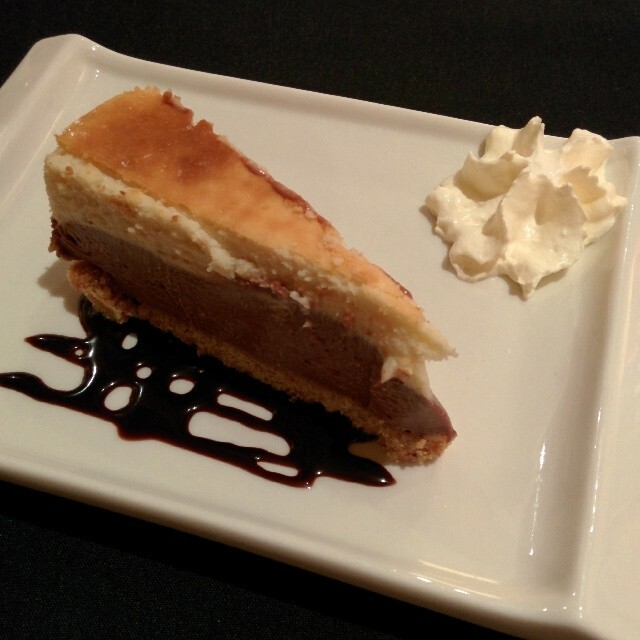 Last but not least is dessert, Frangelico and chocolate cheesecake with biscotti crust. So decadent, so good. I’m a savoury guy so when a dessert wows me it has to be pretty great. For all of you craft beer fans out there you’ll be glad to know that Sabatino’s has Fat Tug IPA and Whitebark Witbier from Driftwood Brewing on tap. If you’re in the mood for Italian check out Sabatino’s Trattoria in South Surrey, it’s a nice spot and a bit of a hidden gem. 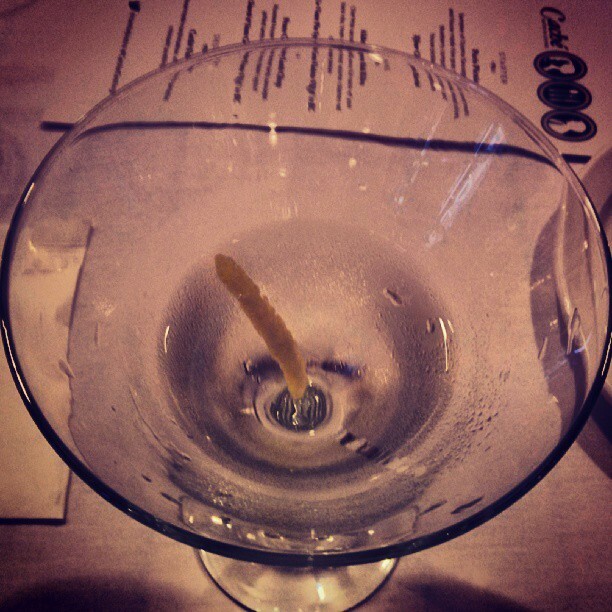 *My food and drinks were provided at no charge by Sabatino’s for review purposes. I have the urge to write this fine spring evening. I haven’t been anywhere in awhile that deserves a full post but I have eaten some great stuff in some random places. I went digging through my Instagram pictures and picked out some winners. 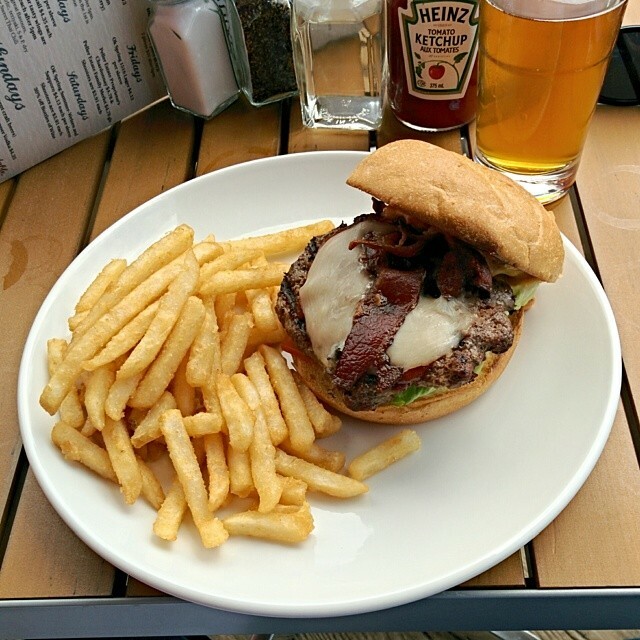 Bigger Better Bacon Cheddar Burger from Earls on Smithe street. 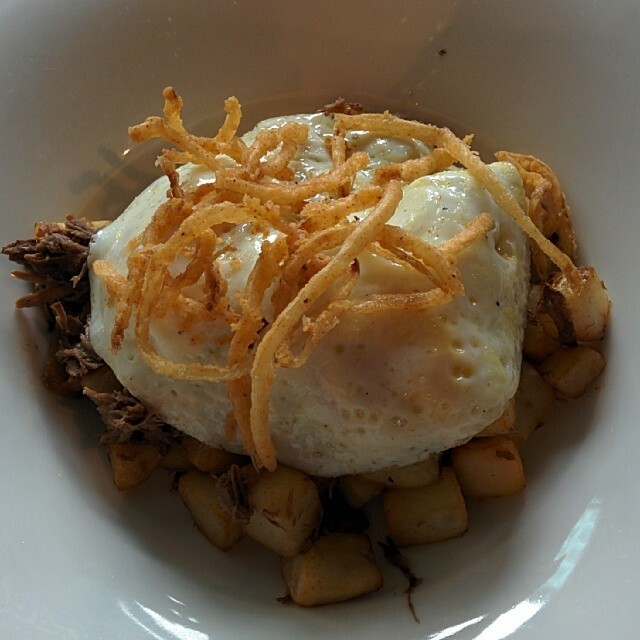 Short rib breakfast bowl from Central City Brewpub in Surrey. 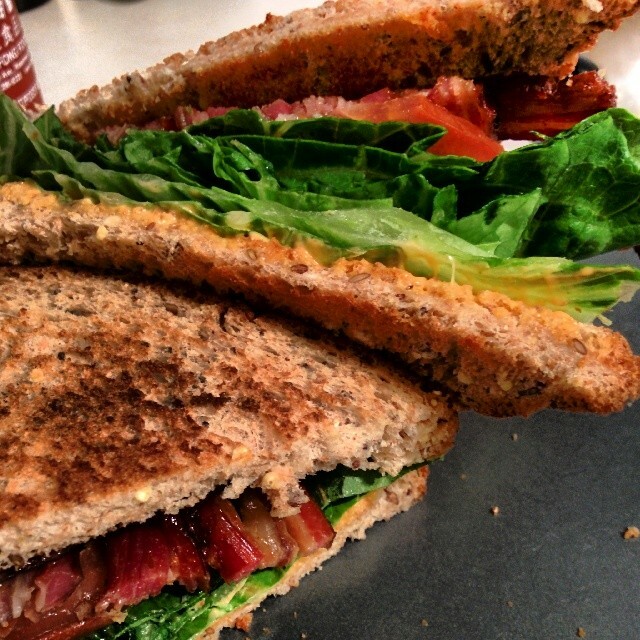 Home made Lamb Bacon BLT with Sriracha Mayo. Lamb bacon courtesy of John from the Hog Shack in Steveston. Prepping for the “black box” portion on the first BBQ competition of the year with John from the Hog Shack. Good times! 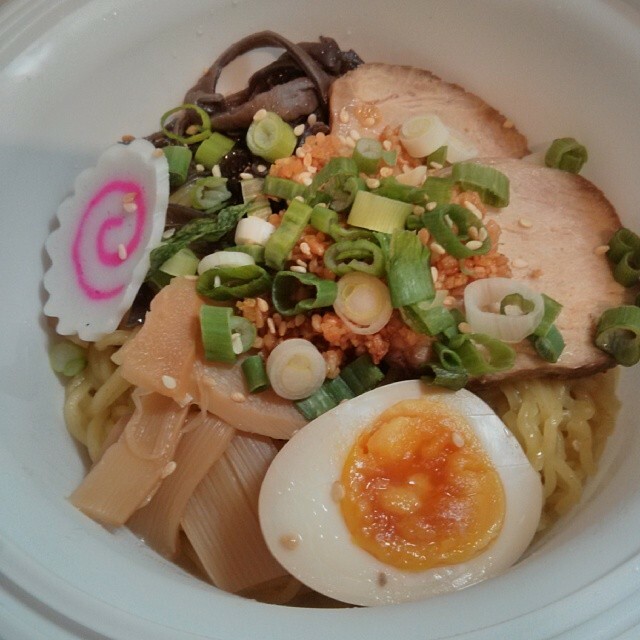 Fantastic ramen from Full Ramen in Surrey. 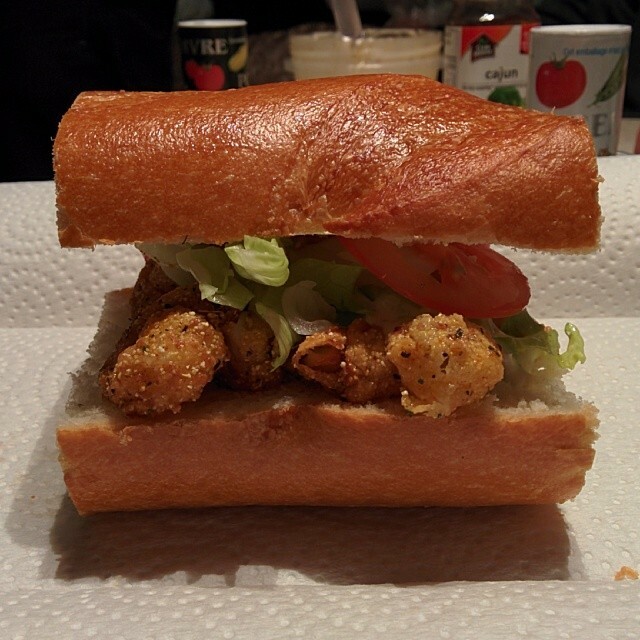 Shrimp Po Boy made by Rusty of Rusty’s BBQ in a trailer at 10:30pm behind a barn in Chilliwack. It was delicious! Rusty enjoying one of his Po Boys. Is sushi healthy? Well, it can be but you have to be concious of what you’re eating. Sashimi is the only sure fire thing that you can count on to be low in fat and salt. Salt and fat are very prevalent in North American style sushi, especially special rolls. Shizen Ya takes Japanese cuisine and gives it health concious makeover with brown rice, low salt content with no MSG, no additives, organic greens and lots of vegetarian options. At this point you’re probably asking yourselves “why the hell was Scott eating at this place? 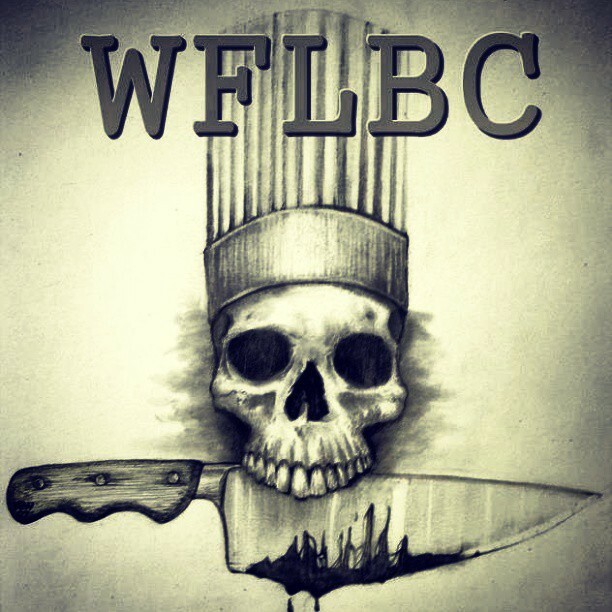 !” Like I said we’re trying to branch out a little at WFLBC. Car reviews, healthy food… It’s crazy days around the office. Turns out that Shizen Ya is really good. The fact that it’s a healthier option is a bonus. I ordered the chicken udon lunch special that comes with a salad, a 3pc dynamite roll and a 3pc salmon roll. The salad was just like a traditional green salad you’d get at any other sushi joint except the organic greens are way more interesting that iceberg lettuce and the miso dressing is less oily and less salty than the norm. 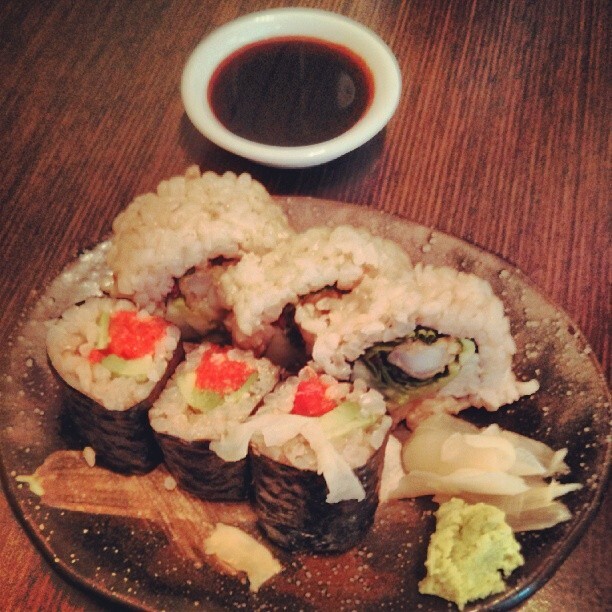 I was pretty sceptical about the rolls, brown rice sushi has always seemed a little off to me. I’m not sure if it’s the texture or the fact that the rice plays a bigger part in the flavour of the roll but I’ve never been a fan. These rolls manage to maintain the texture of a regular non brown rice roll and the rice didn’t affect the flavour as much as I’m used to. The dynamite roll was actually small enough to eat in one bite without looking like an idiot and the salmon rolls were super fresh and tasty. These are the best brown rice rolls I’ve had, period. 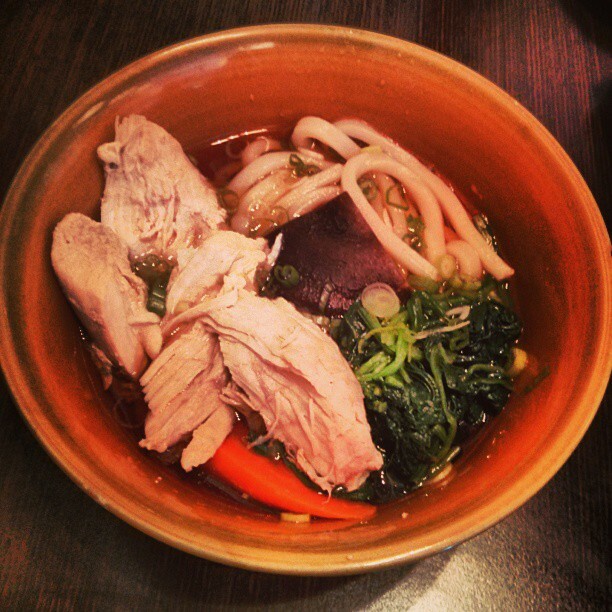 The chicken udon is the least oily, least salty soup I’ve ever had at a restaurant. 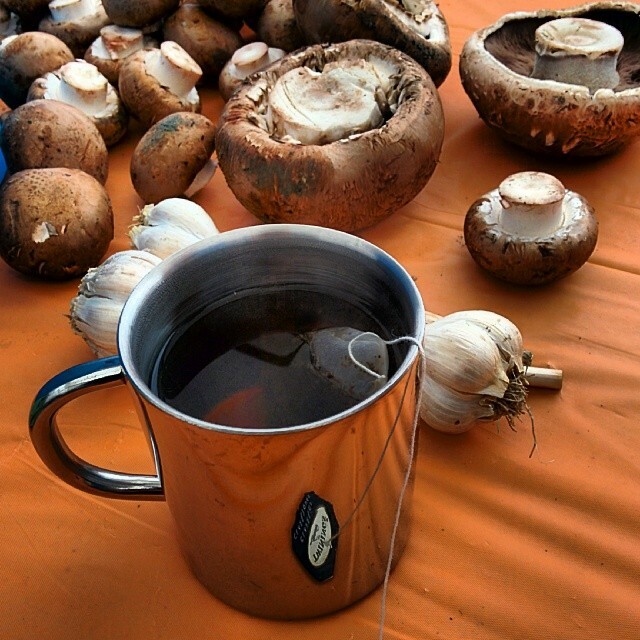 You may think that’s a bad thing but it actually means you can taste things other than the broth. The chicken breast is also unseasoned and very lean. the udon noodles are fat and perfectly cooked and there’s some gomae on top for and extra hit of healthy. It all sounds really bland but they bring a small shaker of seasoning for you to add to your soup that has some heat and let’s you control your own sodium intake. It all works and for under $10 this is a very filling lunch. 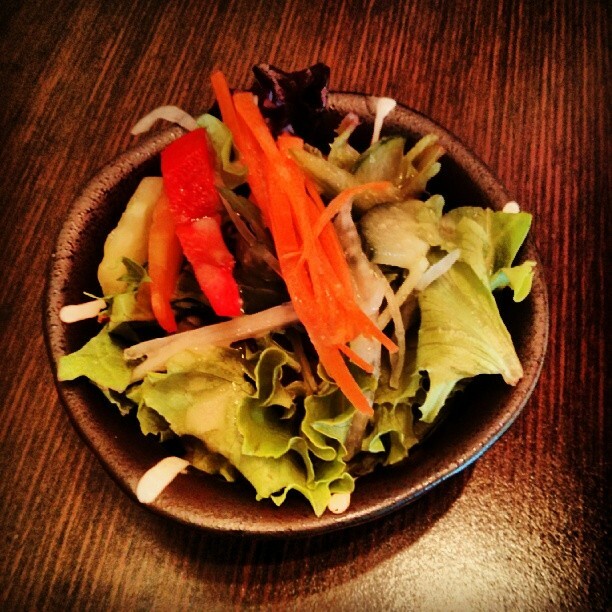 Shizen Ya is a great healthy alternative to traditional sushi. They have two locations, one on West Broadway at Spruce and another at Hornby and Nelson. Cache Bistro and Lounge in the heart of Yaletown is the debut restaurant of Hong Kong born chef Alex Mok. Chef Mok boasts an impressive resume including learning under Chef Herves Martin, the once private chef to the late King Leopold of Belgium. Chef Mok’s technique is classically French complimented by Asian flavours and locally sourced ingredients. 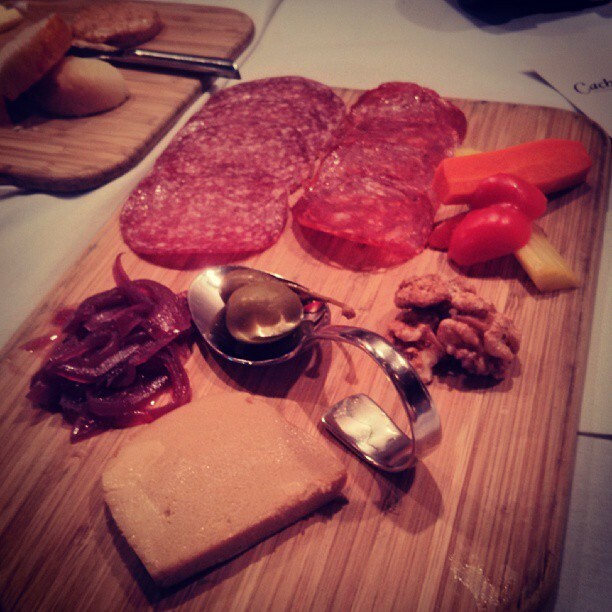 I was invited to try a few dishes from their new menu and guess what… It’s really good! First up was a nice plate of house made bread with 2 house made butters, a truffle butter and a peanut butter infused butter. 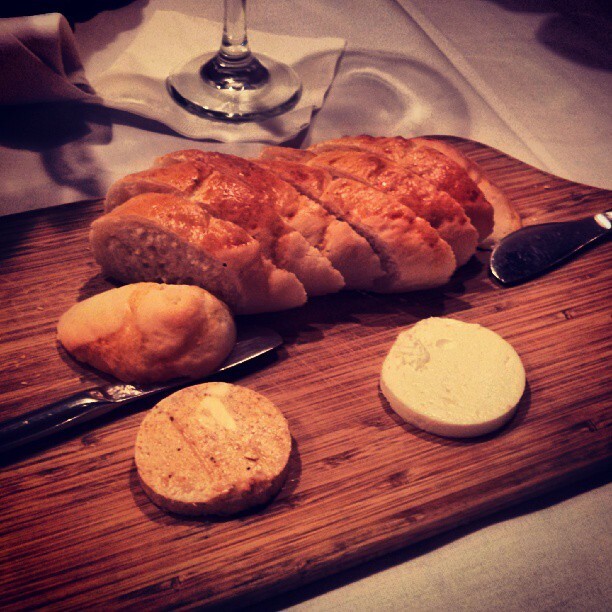 The bread was good and the butters were nice as well, especially the peanut butter butter. Next up was the Paris Plate, a lovely charcuterie board with thinly sliced sausage from Oyama, a very intensely flavoured foie gras mouse, pickled vegetables, mixed olives, onion jam and some walnuts, All of this wonderfulness (which is totally a word) was paired with a classic Martini with a twist made with Xfour Vodka which is made in Vernon. I sampled 2 mains, first up was Aldergrove Mok Ribs. 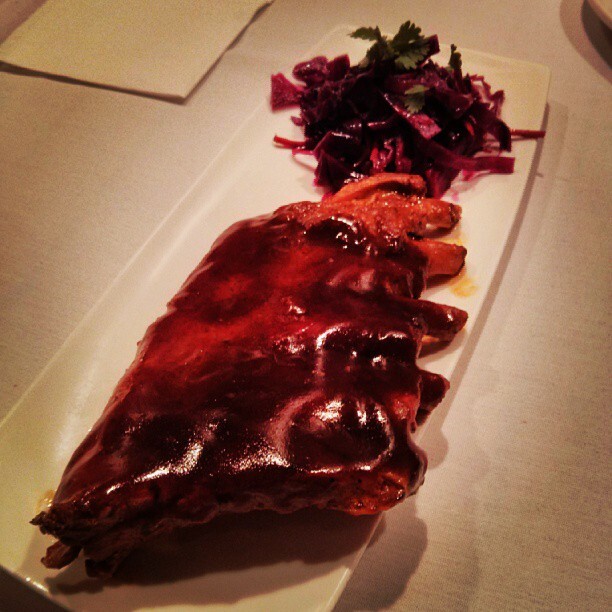 A full rack of pork back ribs with Chef Mok’s secret BBQ sauce and a red cabbage slaw. The ribs were incredibly tender and the BBQ sauce had a nice Asian twist with some hoisin sauce and a few other Asian flavours blending nicely with the rich BBQ flavours. The ribs were paired with a 2011 Le Vieux Pin Syrah Cuvee Violette. 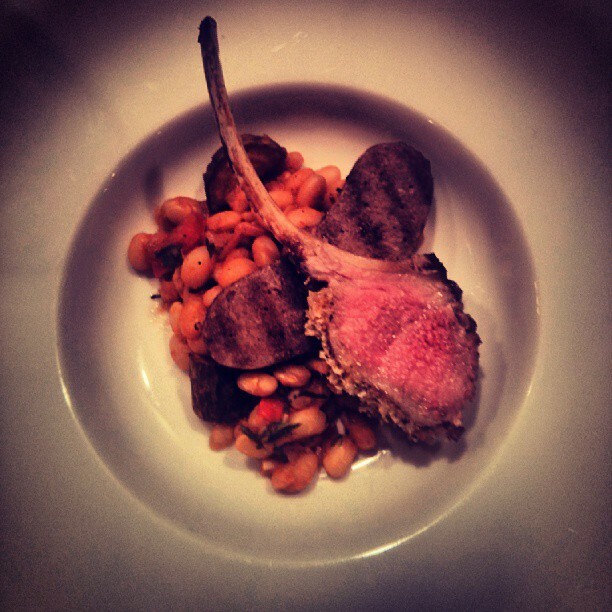 The second main was my favourite dish of the night, Peace Country lamb chop with roasted house made fennel lamb sausage and a navy bean ragout. The lamb was perfectly in that magical zone between medium rare and medium and had a nice salty crust. The lamb sausage was rich with flavour and had a nice firm texture, very impressive for a house made sausage. The beans still had some firmness as well which is just fine with me, mushy beans are gross. This delightful dish was paired with Church and State Cab Franc, I’m not a wine expert by any definition but this wine is terrific. 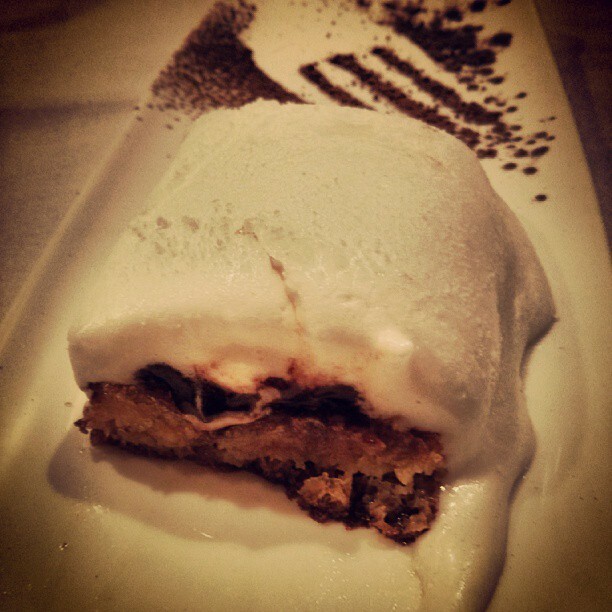 Last but certainly not least was dessert, the Cache S’more. Croissant bread pudding, chocolate ganache and house made coconut marshmallow baked to perfection. The coconut marshmallow was perfect and proves once again that it’s not the taste of coconut I dislike, it’s the texture. The plating of this dish was quite lovely with an artistic dusting of powdered chocolate with the outline of a fork in it. It was so pretty the picture you see here was featured at Gastropost Vancouver. 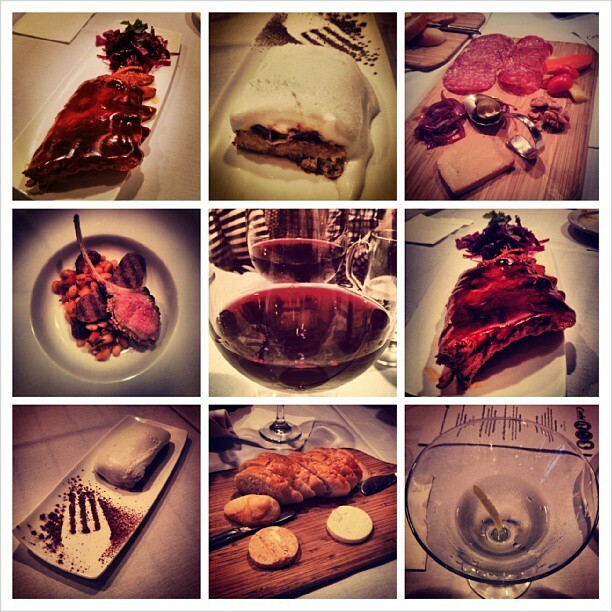 Cache is the real deal, go see for yourself. Thanks to Cache and co for inviting me out and feeding me some fantastic food. Join us for an evening of debauchery as Hog Shack celebrates its 3 yr anniversary and our team serves you a competition level BEER & BBQ FEAST like no other! This is our once a year flagship event. Walking away with several top finishes and awards this past BBQ competition season, Hog Shack’s Chef John Lim Hing will put together a mind blowing Kansas City style BBQ buffet where you will indulge in the city’s finest smoked meats. Allan and John will pair their top 6 beers of 2013 they have personally chosen to indulge with the SWINEFEST MENU. One of those beers will be the highly sought after Driftwood “Sartori Harvest Ale” in a CASK! There will be LOTS of door prizes to win, and an entire evening of BEER & BBQ mayhem. After being a part of the Hog Shack Competition BBQ team for the past year I can tell you that you’re in for a treat. 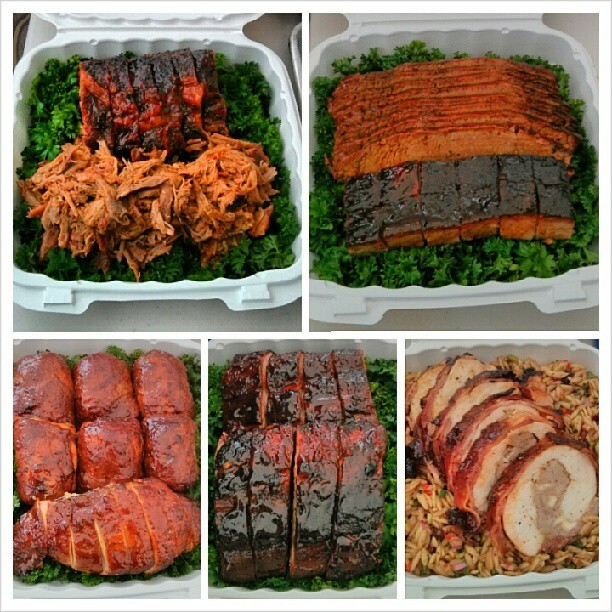 Competition BBQ is like nothing you’ve had before, here’s a shot of some of Johnny’s turn in boxes from this year’s PNWBA events. And a Sartori Harvest cask?! You can guarantee you’ll see me at this celebration of smoked meat and hops. Every now and then I stumble across a hidden gem. Gordy’s Cafe in North Delta is a classic Dive Diner serving up all day breakfast, hot and cold subs, house made burgers and shakes, a classic diner menu from start to finish. The thing about Gordy’s is…well it’s not going to win any interior design awards. It looks old but in a comfortable, lived in way that I love. No pretension whatsoever, just nice people making good food. The burger menu is particularly interesting so I decided to dive in head first and try the Cheddar Craze burger. 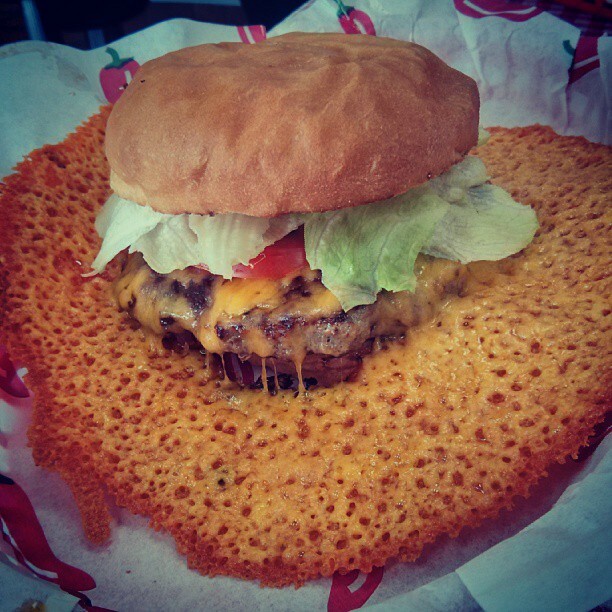 The menu describes it as a single (house made) pure beef patty with 1/4 pound of cheese… That’s a lot of cheese. It comes with lettuce, tomato and mayo on a fresh baked bun. I was curious what a burger with a 1/4 pound of cheese would look like and when it arrived I was super happy to see a cheese skirt! A cheese skirt is a ring of fried cheese that is one of the greatest things ever made (that’s probably an exaggeration). First made popular by the Squeeze Inn in Sacramento, California and featured on the Food Network’s Diners, Drive-ins and Dives it has become something that other restaurants are trying to replicate. The burger on it’s own is fantastic. Juicy, fresh, high quality beef on a fresh bun with quality produce and real mayo. 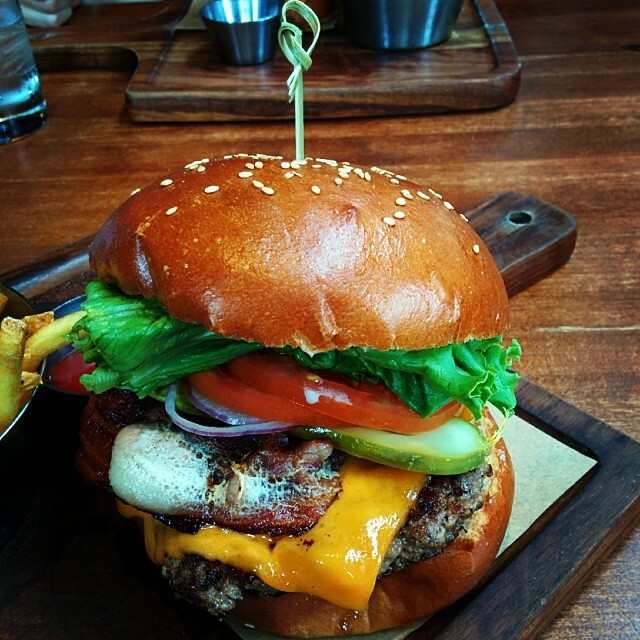 Add the cheese skirt and this burger becomes a contender for best burger in Vancouver. Pro tip, take half the cheese from the cheese skirt and put it back in the burger, eat the other half on it’s own. 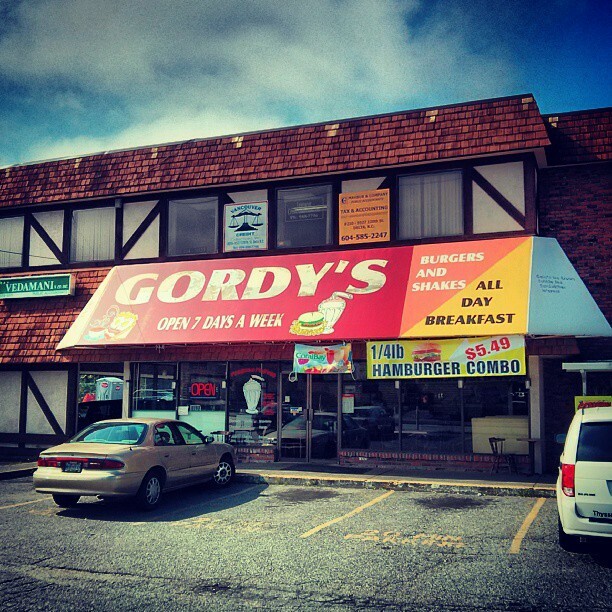 Gordy’s also has REAL milkshakes made with ice cream and they make Screamers, a slurpee with soft serve in it. If you’ve never had one you’re missing out on a classic. Check out Gordy’s Cafe at 9535 Scott Road in Delta. If you follow me on Twitter you probably know that I like to speak my mind on various topics. Usually my opinions fuel some heated debate and sometimes it gets downright ugly but at the very least it gets people talking/thinking about issues that affect our daily lives. This post is the first in a new series of weekly posts intended to bring these issues to a wider audience. This is going to be fun. Topic number 1, food trucks in Steveston. Over the weekend I saw that the Le Tigre food truck was at the Steveston Farmers Market. I know that food trucks are staples at other farmers markets around the Lower Mainland but I don’t agree with food trucks operating anywhere near Steveston. 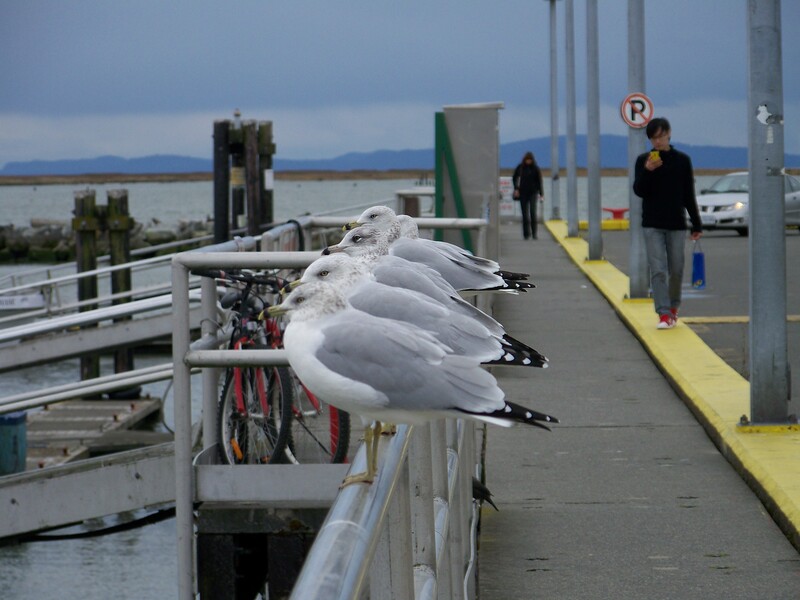 Steveston is an extremely seasonal area for restaurants and they have to stick it out through the slow fall and winter months relying on summer business to make ends meet. To have a food truck pull into town on a sunny summer day and take customers away from these businesses doesn’t sit well with me. Le Tigre has done nothing wrong. They have the required permits, they’re great people and they make great food, it just shouldn’t be happening in Steveston. Sorry guys, I love you but… you know. I have the same opinion about food trucks at White Rock Beach so if a food truck shows up there I’m not going to be happy about it. Topic number 2, Norgate residents complaining about noisy trains. 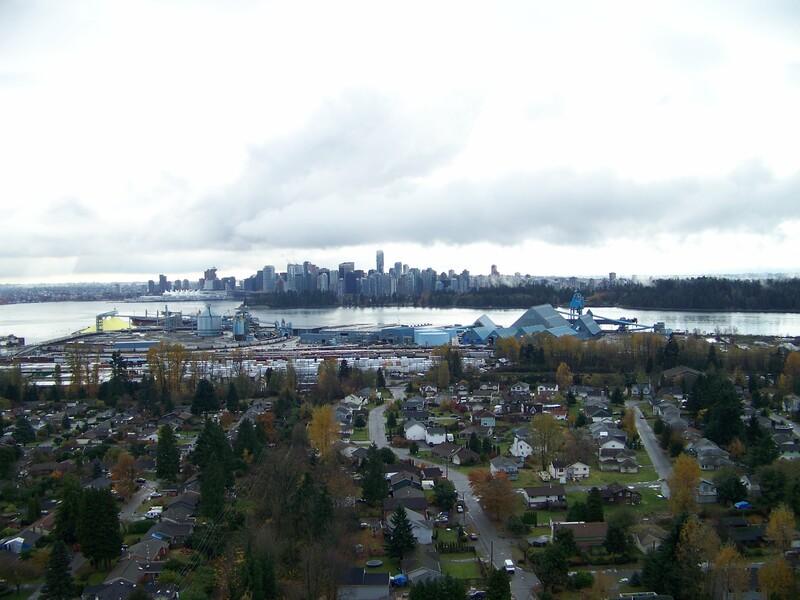 Norgate is located in North Vancouver just east of the Lions Gate Bridge and south of Marine Drive, so basically right beside the CN rail yard, also right behind the beautiful sulphur piles along the shores of Burrard Inlet. Norgate was developed in the 1940’s to house shipyard workers and is mostly small bungalows with an average selling price somewhere near $650,000. The rail yard has been a part of this neighbourhood for FAR longer than the current residents have lived there. For them to complain about the noise is ridiculous. There were similar complaints in New Westminster a few years ago and they met with the same public reaction. It’s like moving in next to the airport and complaining about noisy planes. If you can afford a $650,000 house you should be smart enough to buy something that isn’t right next door to noisy industry. Two polarizing topics, feel free to add your thoughts to the comment section. Let’s keep it clean though, ok?